As night falls in the ancient city of Changde in Hunan province, a large-scale live performance called Taohuayuan, or The Peach Blossom Spring, begins on the misty Qinxi Stream, beginning with a joyful and heart-stirring fishing song. The 90-minute musical show is adapted from the legendary fable of the same name by Tao Yuanming, the great poet in the Eastern Jin Dynasty (317-420). The Qinxi Stream, with miles of peach trees on both its banks, resembles the one that the fisherman sailed in Tao's story. In the story a fisherman comes upon a huge peach forest while sailing in a river. Exploring it he finds a narrow grotto leading to a secret paradise, an idyllic valley－full of houses, crops, farms and animals－where people have been living free of war and conflict for centuries. Enjoying food and wine from his generous hosts, he leaves, later attempting to return with others using markings he left. But the markings have gone and he can't return to his lost utopia. The show employs breathtaking natural scenery along the 4.6 kilometer river and features 18 haunting spots along the river banks, that serve to create a pastoral panoroma. Unlike other live shows, where auditoriums and acting areas are clearly separated, audiences to this show are arranged to be part of it, to better experience the story's fantastical scenes that have entranced the Chinese people for hundreds of years. 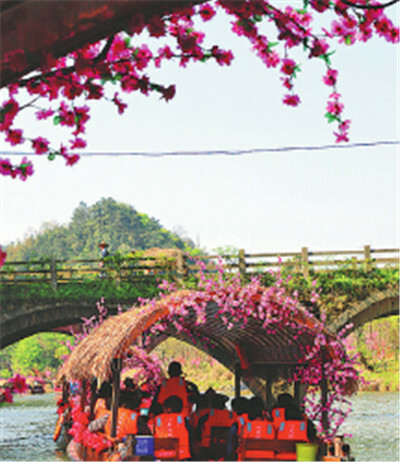 Under the shining stars and accompanied by the flickering peach blossoms, visitors travel in ancient-style fishing boats, seeking the utopian world of Taohuayuan. A cast member, a fisherman in No 2 boat, breaks the magical silence with a song: "In the place where peach trees are in full blossom, there is my lovely hometown." Gao Jianjun, who plays the fisherman, said he was captivated by singing at an early age. The 54-year-old joined The Peach Blossom Spring's cast last year and is now a regular performer. This year will be the first full season of this live performance in Changde, according to Wu Caixia, head of the Taohuayuan tourism management commission. There are many scenic spots featuring peach blossoms in China, but the one in Changde is said to be the prototype of the Taohuayuan in Tao's story according to Cihai, the encyclopedia of the Chinese language, Wu added. Changde closed the scenic area from 2014-17, expanding it and improving its tourist facilities, including establishing more than 60 homestays. Last year the management commission planted 4,000 new peach trees in the Taohuayuan scenic area. Every March, 132 varieties of peach trees－nearly 100,000 peach trees in total－start blossoming in the scenic area, which covers more than 600 hectares.